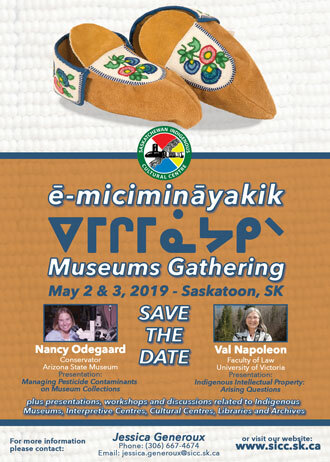 The Saskatchewan Indigenous Cultural Centre (SICC) will host its first Museums, Cultural Centres, Archives, Interpretive Centres & Libraries Gathering on May 2-3, 2019 called the ē-micimināyakik Gathering. This event will be held at the Ramada by Wyndham in Saskatoon. This unique event is focused on Indigenous issues for museums and communities. “Our goal is to share issues, ideas, progress and solutions for First Nations museums, cultural centres, archives and libraries. We invite contributions from the Indigenous community as well as from Indigenous researchers, professionals, scholars and community members,” said Wanda Wilson, SICC President, in a media release. This Indigenous focused event will include presentations to help the participants to learn about caring for collections. One of the presenters is Jessie Ryker-Crawford, an associate professor of the Museum Studies Department at the Institute of American Indian Arts who will present on conservation of Indigenous collections. “The ē-micimināyakik Gathering is a ground-breaking event; to our knowledge, nothing like it has been offered to Canadian First Peoples museum professionals before. We are so honored to be a part of this event, and look forward to participating,” said Professor Ryker-Crawford. The SICC has served First Nations people since 1972. It was the initial First Nations controlled educational institution serving at the provincial level. The SICC strives to maintain the cultural and linguistic identity of First Nations cultures who inhabit what is now known as Saskatchewan: Plains Cree, Swampy Cree, Woodlands Cree, Dene, Saulteaux, Dakota, Nakoda and Lakota. For more information on the ē-micimināyakik Gathering, or to find out how you can make a difference in preserving and revitalizing Indigenous heritage in Saskatchewan, contact Jessica Generoux at 306-244-1146 or email: jessica.generoux@sicc.sk.ca.